Built for safe usage, the Fakro Steel Attic Ladder is designed with a locking mechanism along the inside surface of the door for added security. The attic door is well balanced and opens and closes easily without sudden movements, with springs located on the door surface to create a wider opening to your attic for comfort and safety. Built to accommodate a variety of home designs, the ladder is adjustable in length, door distance and spring tension to suit the needs of your space. 10 ft., 22.5-inch x 54-inch Fire Insulated Wood Attic Ladder with 300 lb. Capacity Type IA Rating is rated 3.6 out of 5 by 8. Rated 5 out of 5 by Rod from Finally found a good attic stairway with a reasonable price I had a customer that wanted a insulated fire rated attic stairway. Had to return one that was a different brand from a different store because of sloppy workmanship. Salesman there said there all made cheaply unless your willing to pay 1500 dollars. Well I didn't have that much room in my contract. Found this one and had good reviews but was a little afraid to buy it without seeing it but since Home Depot takes returns easily even when bought over the internet I took the risk. It turned out that this was a lower cost than the other one I ordered. It is completely sealed around its edges when closed. Other products have air holes at the piano hinge on the door. It has a metal pole for pull down so you don't have to have a string dangling in your garage if you don't want. The insulation is between two panels so it is not exposed like on some doors. It also works very smoothly and has approximately 1.5 inch of adjustment on the ladder length in case it doesn't fit right the first time. The system also let's you cut a straight cut and attach plastic feet to the bottom. May be helpful for homeowner installations but I just cut them so the wood would fit the floor. Unlike the first door I bought the jamb corners were all actually flush so I could install casing without 1/8 inch gaps. Because I was concerned about not being able to find a door that my customer would be satisfied with it felt good to hear the customer say another excellent job like usual. Good workmanship alone cannot suffice without available good products. I seldom write reviews but when something stands out in the field to this degree it deserves recognition. Rated 2 out of 5 by d35 from Cracked I purchased the stairs for my garage, since I needed to replace the existing pull down that had no fire protection. When the unit arrived, the frame was cracked and split in three places. The ladder and firewall were of high quality, but the frame was cracking and splitting at three of the four corners. Rated 1 out of 5 by Anonymous from Quality isnt worth the price I was putting an attic ladder into my garage, so needed a fire rated model. After waiting a week for the item to be shipped to my local home depot, the box was a bit banged up. Upon getting the ladder home the frame was cracked. I don't blame home depot....the manufacturer used really cheap pine for the frame put together with a couple staples at each corner. I didn't have time to wait to replace it so I just rebuilt the whole frame in poplar and 7" high as oppose to 5". That took a couple hours but works awesome now. Non fire rated models run $100 or $150. So I view the quality to be really poor for $400. Rated 5 out of 5 by Attic101 from Strong and easy to use Although I had a carpenter friend install the unit he didn't have any issues. I highly recommend these stairs. 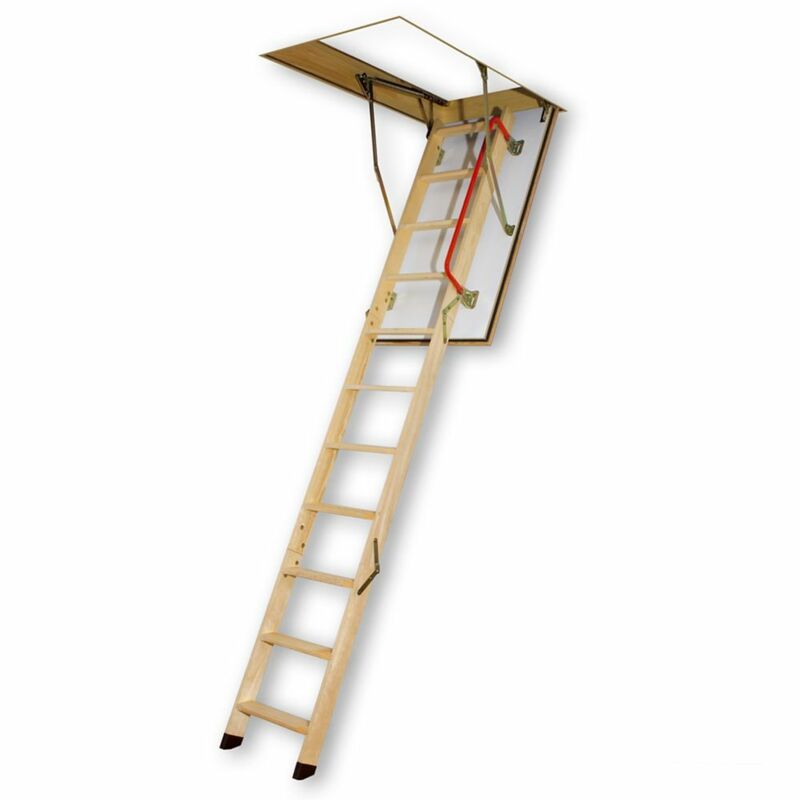 Rated 5 out of 5 by CSaintD from Just what we needed This fire-rated attic access ladder and door is very nice. I looked all over for something that was fire rated to put in our garage. There were lots available, but they were very expensive. The price on this is reasonable and I had it shipped directly to the house for free. The door is solid and comes with a bar that you can pull it down with. It is light red in color, which I do not mind, but you could paint it if you wanted it to match the ceiling exactly. It is very sturdy and has a rail to assist you when you get to the top. I had it installed by a handyman, so I cannot comment on ease of installation. I did however have to buy trim to go around the outside of the door to make it look nicer - actually I had some extra baseboard molding that we used to trim it out. I am very happy with my purchase. Rated 2 out of 5 by tnicks from Disappointed, but with who? Unfortunately, it is difficult to figure out who is to blame in my situation. My guess is that both UPS and Fakro are somewhat at fault here since I ended up receiving two ladders that were damaged. One appeared to be clearly damaged during shipment, but another appeared to possibly be just poor quality control as one of the boards looked just bad. In both cases though, the wood was cracked in multiple locations as well. The wood used on the stairs and the ladder is good, but the surrounding box just falls apart. If I wasn't putting most of the blame on UPS, I'd give these stairs a 1. The cost is high though and they are apparently delicate enough that I can't get Home Depot / UPS to get a set to my house undamaged. It's a shame, I really needed a fire rated system since my garage attic is not separated from the house attic by design. Rated 5 out of 5 by Azgold from Worked great. Was shipped to my home. Arrived as expected. Unit is well built and engineered. Quite heavy at 80#s. fit perfectly. Needed two people to manhandle and install. Have shims and cabinet screws on hand. I used fireproof foam to completely seal joist gaps. Trimming ladder to size took a couple of tries. I purposely started longer than needed, then trimmed a little at a time.